I started out using Stamping Up Retired Stamp set - Silly Sea life and then embossed it with my new stamping up embossing folder Softly Falling. Then I colored those cuties using Copic markers and papers used were Recollections Glitter Paper Pad and Recollections 110lb weight white card stock. The circles were cut using Nestabilities Dies and some sequence to look like water. Lol I really enjoyed making this. I would like to enter the following challenges. Challenge #169 - Anything Goes! No Twist. 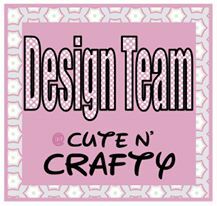 Crafting by designs - Anything Goes! What an adorable shaker card! I have not tried to make one of these yet, someday I hope to though! 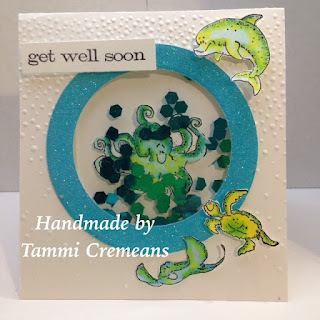 I love the sea creatures and the way you colored them and I love that embossing folder and would love to know the name of it too! Threat job on your first shaker - it's cute, colorful and fun. Thanks for showing it off at 613 Avenue Create. Really cute shaker get well card. Sure to make that special someone feel better. Thanks for sharing over at Inspiration Destination. Gorgeous shaker card Tammi! So cute and I love the texture. woe great shaker card. 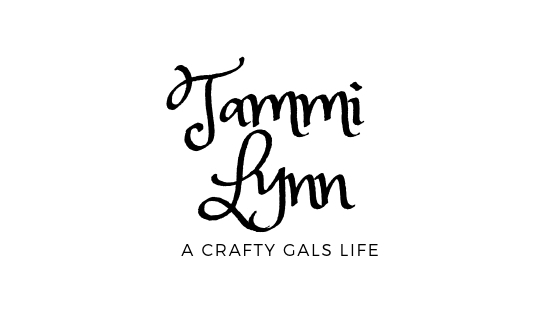 Thank you for joining the Crafty Gals Corner challenge. Thank you soo much for taking part in our "in the garden" challenge over at Come and Get it.